Microsoft's Windows operating system provides a very capable and simple to use backup function which suits most companies, but it doesn‘t support removable media solutions such as RDX removable disk or LTO tape. Companies had to use additional software or external hard drives for their backups. In some cases, companies would skip system upgrades to keep their backup strategies alive. With the new generation of RDX USB 3.0 devices from Tandberg Data, we fill an important gap and provide you with the missing functionality that enables you to use removable RDX media for your day-to-day backup operations, and more. 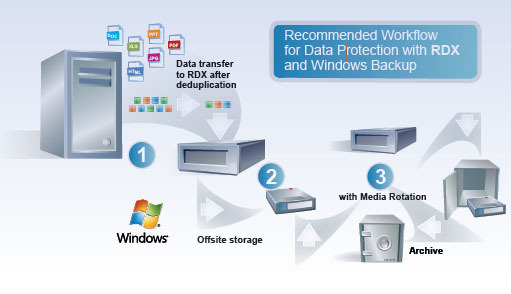 If you‘re looking for an easy-to-use backup solution that is simple to administer and gives you the flexiblity of using removable media to create off-site copies, then RDX is for you. If you want to store your data at another location, you have to disconnect the external hard drive’s USB connection from the computer. When you reconnect, the USB drive may be assigned another drive letter, and then the backup process no longer works. RDX QuikStor however stays connected, and when removing or inserting a RDX cartridge, the drive letter remains the same. RDX QuikStor can be connected to the USB port as an external drive or as an internal drive directly in a server chassis. The special design of RDX QuikStor eliminates server failures due to statically charged peripherals. The RDX cartridge is incredibly rugged and shock resistant to accommodate accidental falls from the rack or desk, which also results in longer life and higher reliability. RDX QuikStor from Tandberg Data is a removable disk system with removable media that provides small and medium-sized companies with robust, reliable and convenient storage space for data backups, archiving and data exchange. It is particularly well suited to offsite company data storage. The storage system offers a transfer speed of up to 330 Mbps thanks to SuperSpeed USB 3.0 and combines the benefits of tapes and disks at an affordable price. It’s possible to store up to 4 TB of data on a cartridge with a hard disk drive and up to 256 GB on the SSD version. Archive data for ten years and benefit from an advance replacement service for defective devices with a three-year warranty. RDX media are protected against dust and electrostatic discharge. They are robust and shock-proof and can survive falls from a height of one meter.